The mystery of the selective filtering devices has been solved, unfortunately as has become the norm that's all I can say about it. Suffice it to say the forces behind it are probably somewhat bitter over the wasted effort. Meanwhile in other news Steam did a thing. 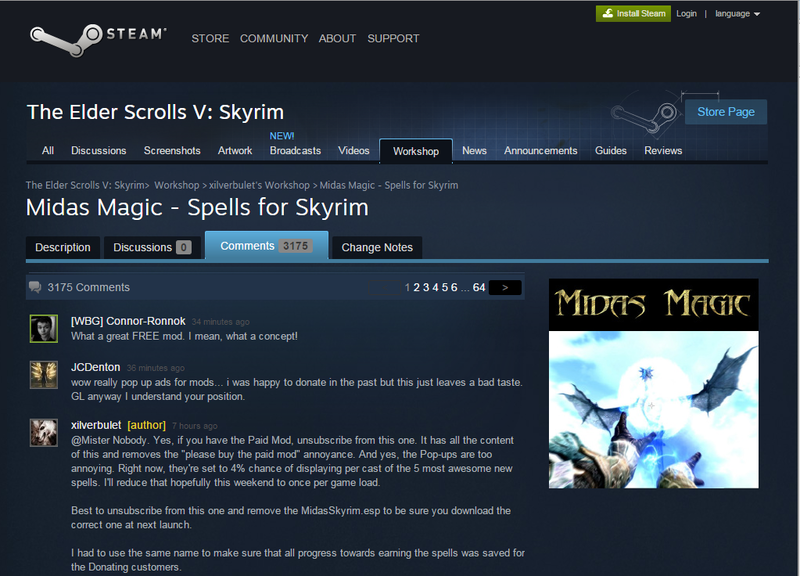 Yes, now you, hobbyist video game modder, can sell your game modifications via Steam. 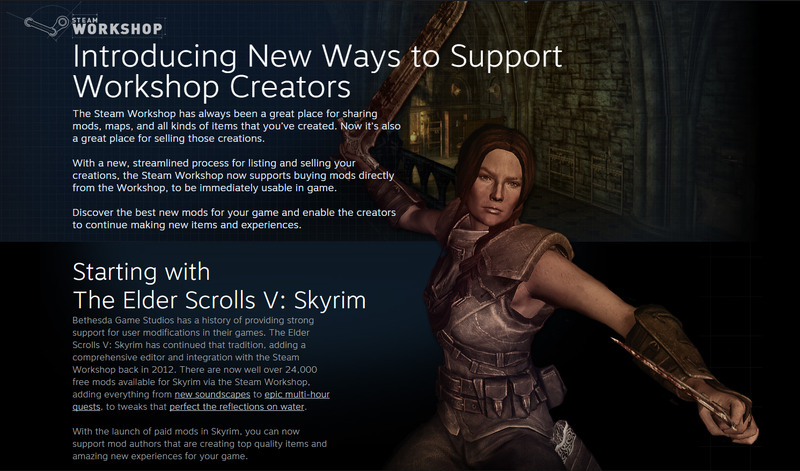 75% of the proceeds go to Valve Software, and the majority of that then no doubt goes to Bethesda... But you still stand to earn twenty five cents of every dollar or euro spent. Provided you earn one hundred dollars U.S. or more. Yes, now you can charge money for modifications you make to your game. Or, alternatively, someone else's modifications! Another fine product by Just Arty, not my censor work for the record but I can't say I mind. Sure, there is a DMCA takedown feature, but the sheer amount of time Valve is going to have to put into sorting the valid from the invalid is going to be absurd and some of the cheats will surely slip through the cracks. People are going to feel like suckers. Meanwhile, what will this do to the modding community? Well, it's not going down too well so far. TLDR: Modder gets contacted by Valve to spearhead this new project. After a conflict is revealed in that part of their mod used free materials made by a third party, they attempt to make their mod free to download again to make amends. Sorry, that mod is theirs to sell now. But then, in Arissa 2.0's case it was 100% the work of them, "Griefmyst" and... I think they might have forgotten someone. Bethesda perhaps? No modification without a game to modify. Mind you, this is what they agreed to beforehand so there is something of a limit as to how much they are justly entitled to whinge. Valve is replacing an ephemeral incentive, pride in creating something people enjoy, with a cash incentive- and demonstrate a tragic ignorance of how disastrous that swap can be. This article by the Harvard Business Review discusses the effects. "Dozens of recent experiments show that rewarding self-interest with economic incentives can backfire when they undermine what Adam Smith called “the moral sentiments.” The psychology here has eluded blackboard economists, but it will be no surprise to people in business: When we take a job or buy a car, we are not only trying to get stuff—we are also trying to be a certain kind of person. People desire to be esteemed by others and to be seen as ethical and dignified. And they don’t want to be taken for suckers. Rewarding blood donations may backfire because it suggests that the donor is less interested in being altruistic than in making a buck. Incentives also run into trouble when they signal that the employer mistrusts the employee or is greedy. Close supervision of workers coupled with pay for performance is textbook economics—and a prescription for sullen employees." This of course, assumes that we discard the especially pessimistic take that Valve and Bethesda know exactly what they are doing. I should hope they do not fear competition with their fans quite that much though. More likely they are all seeing dollar signs themselves, this project is less a means of allowing modders to 'make a living doing what they love' and more bait by which Valve and the developers who take part in this can monetize the hobbyists who make these mods. To the tune of 75% of money brought in. They are putting the hobbyists to work for them with the allure of money the vast majority of them will see little to nothing of. It also adds an element of suspicion and fear into the modding community as people come to worry about something they make for free being sold by a third party. If Valve truly cared about encouraging people to show modders appreciation with currency, all they really had to do is support donation buttons. But what then would be the payoff for Valve? Besides a healthy, happy community that is. For more about the dire risks inherent in screwing around with monetary incentives, here is what smarter people than the brains behind this project have to say about it. All of this isn't getting into the ill-will being generated by the Modders with visions of dollar signs. Pop-up ads in-game! Just what modding needed.